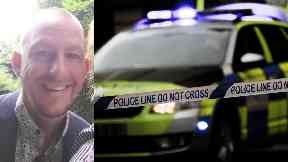 Stuart Elliot, 40, was pronounced dead at the scene in Edinburgh on Wednesday. Investigation: Stuart Elliot died after a collision in Edinburgh. A cyclist who died after being involved in a collision with a lorry in Edinburgh has been named by police. Stuart Elliot, 40, was pronounced dead at the scene following the incident on Sir Harry Lauder Road at the junction with Portobello High Street shortly after 10am on Wednesday. The road was closed for several hours while investigations were carried out. Mr Elliot's family said he would be "greatly missed". They also paid tribute to the emergency services and all those who helped at the scene. They said: "Stuart was a PhD student at Edinburgh University studying innovative approaches to violence prevention in humanitarian settings. "His partner and family would like to thank the emergency services, members of the public and an off-duty policeman for their time and efforts at the scene. "Stuart's death has come as a complete shock and the family are devastated. He will be greatly missed by family, friends and university students old and new." An investigation to establish the full circumstances surrounding the collision remains underway. Anyone who witnessed this, or who has information which may be relevant and has not yet contacted police, is urged to call 101.